11:30am - 3:30pm Sat. & Sun. 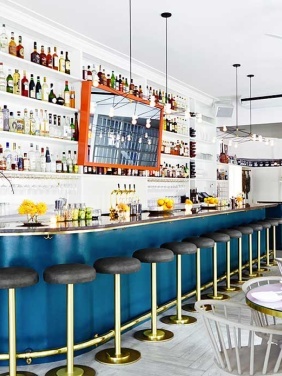 The Upsider is a cool and casual spot perfect for friends to enjoy an easy-going brunch. The neighborhood needed an inviting and fun restaurant like this. Whether you are a party of one or a group of five, you'll be happy here. The bright, white space has orange and blue accents and is part retro, part modern. It's almost as if a diner has been scrubbed up really well and re-made with a fresh, whimsical feel. There are two ways to be smart about ordering here. Simply order the House Pancakes or the Buttermilk Fried Chicken. The Pancakes come two to a stack and they are really, really good. The Fried Chicken has a sweet and tangy taste that makes it unique, and the pomegranate seeds on top are a nice touch. A crowd favorite also happens to be the Avocado Toast and Poached Eggs. A full cocktail menu is available. Try the Pear Tree with Grey Goose Poire Vodka, Pear Liqueur, St. Germain and Lemon, or for a wintry treat, the Crab Apple with El Jimador Reposado Tequila, Apple Cider, Elderflower, and Cinnamon. Brunch reservations are accepted for parties as small as two. 11:30am - 4pm Sat & Sun. Blue Ribbon Bakery is a BrunchCritic favorite and a reliable, consistent hit. Sit downstairs where you can dine in a very cozy, brick-enclosed space. The cavernous space is also the location of the bakery (complete with a 150-year-old brick oven), and you will indulge in the sweet smells of the bakery when walking by. Blue Ribbon is a great place for entertaining out-of-towners who are looking for an iconic NYC brunch. 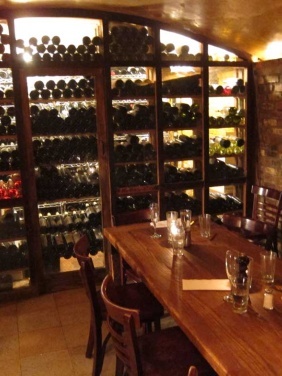 Group Tip: book the private dining room that seats 8 - 12 people for special occasions. While anything you order will be good, Blue Ribbon has two eggs dishes that really stand out. Their version of the Benedict is made with Spinach, Mushrooms and Bacon topped with Hollandaise Sauce. Really, more restaurants should do their poached eggs this way as the spinach and mushrooms add great flavor. The Blue Benedict is also a crowd favorite, made with Cotto Ham, Jarlsberg, and Tomato on Toasted Challah Bread. You won't be limited here. In addition to Bloodys and Mimosas, the full wine menu is available too. Brunch reservations are only accepted for parties of 6 or more.